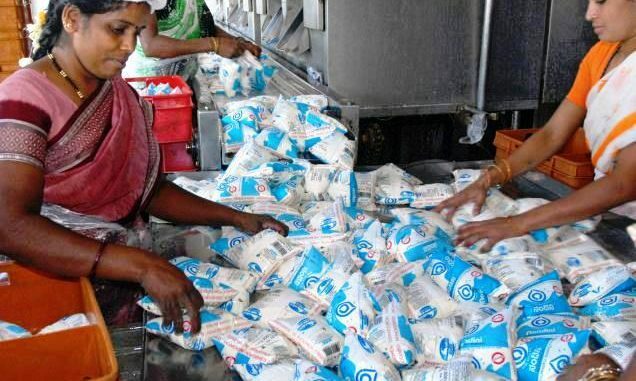 Milk not only surpassed the total value of foodgrains (cereals plus pulses), but also stood way above the crop value of paddy that stood at Rs 2,26,481 crore or wheat at Rs 1,28,998 crore, according to latest figures released this month. Milk has become India’s No. 1 farm crop by value and has overtaken even food grains in terms of production value. Exceeding the foodgrains production for the first time, the value of milk produced stood at Rs 4,86,846 crore, reported by the Indian Express. This not only surpassed the total value of foodgrains (cereals plus pulses), but also stood way above the crop value of paddy that stood at Rs 2,26,481 crore or wheat at Rs 1,28,998 crore, according to latest figures released this month. Today, the White Revolution’s contribution to farm incomes has surpassed that of the Green Revolution. Not only that but every fifth rupee generated in the farm sector, as per the report, today comes from milk. • As milk is harvested not from the fields, but from animals, it loses the ability to be seen as a “crop”. • Unlike paddy, wheat or sugarcane, milk is not harvested and marketed not in quintals, but in litres. • The farmers sell milk round the year, which isn’t the case with normal field crops. • The harvesting and marketing of the field crops is a conspicuous one-time annual event, unlike that for milk. This is even commemorated through festivals such as Makar Sankranti, Baisakhi and Thai Pongal, as per the report by the Indian Express. • The policymakers have always viewed dairying as an activity “subsidiary” to regular agriculture. This may partly have to do with the animals mostly being fed on the by-products of crop agriculture: wheat and paddy straw, sugarcane tops, and the protein-rich cake left after extraction of oil from mustard, groundnut or cottonseed.